Welcome to the land of billion dollar photo sharing-companies. Pinterest, the newest member to the billionaire's club, recently raised 100 million dollars in their latest round of funding. When you crunch the numbers, Pinterest is valued at nearly 1.5 billion dollars. In contrast, Kodak, the company that literally pioneered the photography revolution, filed for chapter 11 bankruptcy earlier this year. As Jerry Seinfeld would say, after his recent comedy stop at the Sony Centre in Toronto: it's a Bizzaro World out there. With seemingly unlimited investor funding and mainstream media coverage, photo-sharing is the new hot topic at the water cooler. Enter Piccsy, the newest social network that helps people discover the images they love. Focused on solving the image discovery and fragmentation problem, Piccsy helps identify categories of interest that are important to users while customizing an image feed specifically catered to their preferences. The Torontonian behind Piccsy, Daniel Eckler, has over 10 years of experience in new media. After selling Everyguyed, his site focused on men's style, and co-founding Vizualize.me, the visualization platform for professionals, Daniel is putting Canada's reputation on the line by bringing Piccsy to the masses. Where did the idea behind Piccsy came from? The idea for Piccsy came from my previous business, EveryGuyed. The network of blogs we published was focused on men's lifestyle and fashion. Over time, we realized that even if we put a ton of effort into analyzing the latest men's fashion trend, our audience would look at the pictures and make a snap judgment without really reading the contextual copy. Pictures seemed to be driving the majority of our traffic. We knew we were onto something and that's when we formed Piccsy. We wanted to create a community that allowed people to be curators of whatever they consider beautiful. Can you describe the typical Piccsy user? What do they get out of using the Piccsy service? Our typical user is between 18-34 years old and is in a creative field. Our users love looking at images for inspiration, entertainment, and creative project references. If you've got friends on Facebook, Twitter, or Instagram, and you're tired of bouncing from network to network sifting through images in user interfaces that aren't focused on image consumption, Piccsy is for you. Our goal is to become your "image inbox"--the place where all of the images that are important to you, from family and friends to creative inspiration and humor, are filtered in a customized and streamlined way. Why are you throwing everything behind Piccsy now? What was the tipping point? It's an interesting time for images online. Tumblr, Instagram, and Pinterest are three examples of success stories that have come out of nowhere. In addition, there are another 100 image focused websites you haven't heard about waiting to scale. 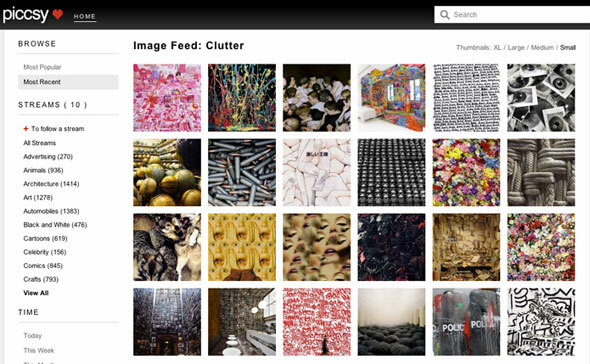 The more the image discovery space gets popular, the more it gets fragmented--and the more important it becomes for a company like Piccsy to clean it all up. It seems Piccsy and Pinterest launched roughly at the same time. How do you compare their success to your business model? On the surface, there are a lot of similarities between the products today. When people look at Piccsy they think we're a Pinterest for creative people. Piccsy's goal, however, has always been to solve the problem of image discovery online, whereas Pinterest seems to be moving in a direction more in-line with social cataloguing. Over the next 6-18 months, you will start to see the significant differences. Pinterest will likely be the place where you go to see what you and your friends have cataloged. On the other hand, Piccsy will be the place where you can discover images easier than anywhere else. We view our future closer to Flipboard and Google Images than Pinterest. Let's talk about your revenue model. Is Piccsy actively searching for funding? Piccsy has been bootstrapped since day one from the profits of EveryGuyed. Also, we were fortunate to be part of a pilot incubator called Start-Up Chile for five months. Going forward, we'll be taking investor meetings in Toronto, New York, and San Francisco this June as we've finally officially launched the product and are ready to scale. How big is the Piccsy team and where did you find everyone? The core team consists of myself, Glenn Michael (creative), and Eric Liang (technical). We have been working together on EveryGuyed for some time and decided to pursue a new project in Piccsy. We'll keep making improvements to Piccsy, and rolling out interesting Piccsy Playground projects. You can see one we just released "Everything You Need to Know About Design" recently. Piccsy's short term plan is to be the place where you discover images online. Our long(er) term plan is to power any and every digital image experience that exists.